American YouTuber, baker and actress Rosanna Pansino known for the famous cooking series, Nerdy Nummies on YouTube. Her self-titled YouTube channel has amassed over 9.5 million subscribers which features baking videos, challenges and DIYs. She has starred as Violet in the animated YouTube series Broken Quest and has played small roles in a bunch of TV series. Rosanna Pansino was born on 8 June 1984, in Seattle, Washington, United States. She has Croatian, German, Italian, and Irish ancestry. 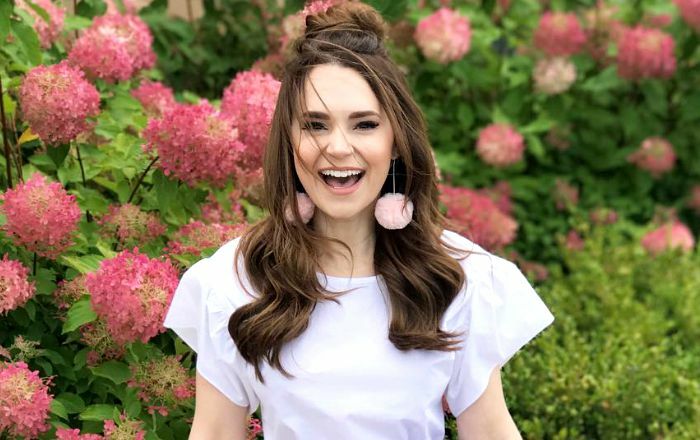 Rosanna Pansino went to the Native American Elementary School and later joined at the Pacific Lutheran University from where she graduated in 2007. Rosanna Pansino is dating e-sports commentator Mike Lamond from 2016. Rosanna Pansino made her silver screen debut in the comedy movie, Amy Alyson Fans for her role as Ahsoka in 2011. In 2010, Rosanna first landed her role in The Scream Queens vs. Zombie President episode of the comedy TV series, NSFW Show. In 2015, she released her debut single Perfect Together on iTunes. Well-known for her own culinary show ‘Nerdy Nummies’. which has several YouTubers as guest including Lilly Singh, Markiplier, and Michelle Phan. Her net worth is estimated to be $9 million as of 2018. She easily makes more than $400 thousand annually from YouTube and also makes it big from other social media activities. She is the creator and host of the the Internet’s most popular baking show, Nerdy Nummies, which she launched in 2011. Pansino has stated that her interest in cooking was inspired by her grandmother. She has uploaded more than 310 cake, cookie and cupcake recipes as part of the Nerdy Nummies series. In 2012, Rosanna won the vote for Queen of the Web with more than 3 million votes. The following year, she won the Shorty Award for Best in Food and in 2016 she won the Kikkoman Breakout Foodies of the Year Taste Award. In 2015, she published her cookbook, The Nerdy Nummies Cookbook: Sweet Treats for the Geek in All of Us, which went on to become New York Times bestseller. In August 2017, she launched her own line of baking supplies. Her younger sister Molly used to accompany her in her cooking videos on YouTube.